During the early fall, when pumpkins were at their finest, I took advantage of the harvest and invested some time in making homemade pumpkin puree. It’s been all about the pumpkin for me since. In the last month, I’ve made pumpkin donuts, roasted pumpkin seeds, and now pumpkin pie. I can’t get enough pumpkin. Pumpkin Pie is always a favourite in our family. It’s taken some time to find a recipe that works for me. There are plenty of them out there. A lot of them incorporate the usual suspect of spices: nutmeg, ground cloves, ginger and cinnamon. I’ve never been a fan of ground cloves so when baking this pie, I omit them. For those that are short on time, you can purchase pre-made pie crusts from the grocer’s freezer section. I often use this recipe from Canadian Living. If you want to get a little decadent, top with a Honey Bourbon Whipped Cream. Of course, if you are serving this pie to little ones, omit the bourbon! Getting the basic ingredients ready. 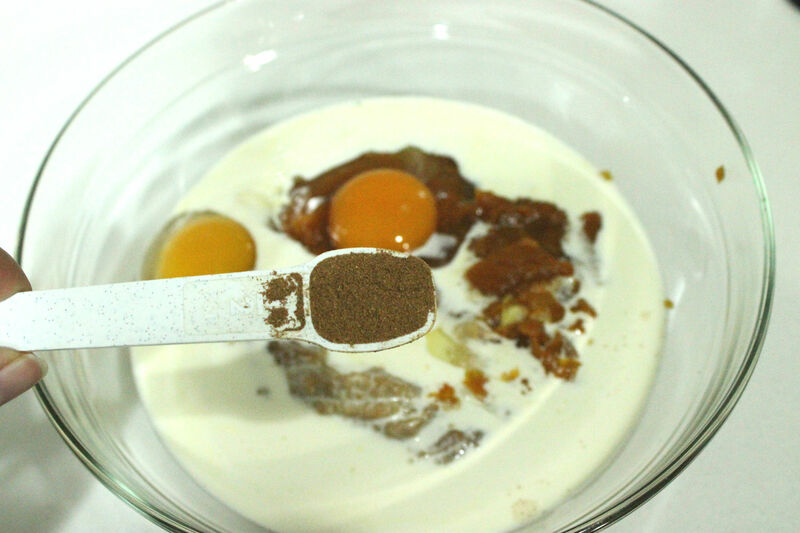 In a bowl, whisk the pumpkin puree, eggs, cream, brown sugar, granulated sugar, vanilla, cinnamon, ginger, nutmeg and salt. Alternatively, instead of adding the individual spices, you can substitute the cinnamon, ginger and nutmeg with equal amount of pumpkin spice. Adding spices to the mix. 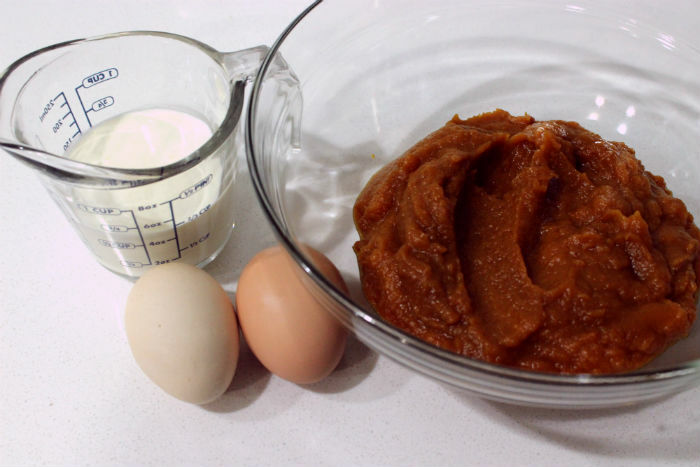 If you are using fresh pumpkin puree, ensure that it’s gone through the food processor a few times and is smooth. Once in a while, I’ll forget this step and get a “lumpy” pumpkin pie. Still tasty, just not as pretty. Pour the filling into the prepared pie crust. If you are using store bought pie shells (which come in packages of two), you can evenly distribute the filling but the pie will be thin. 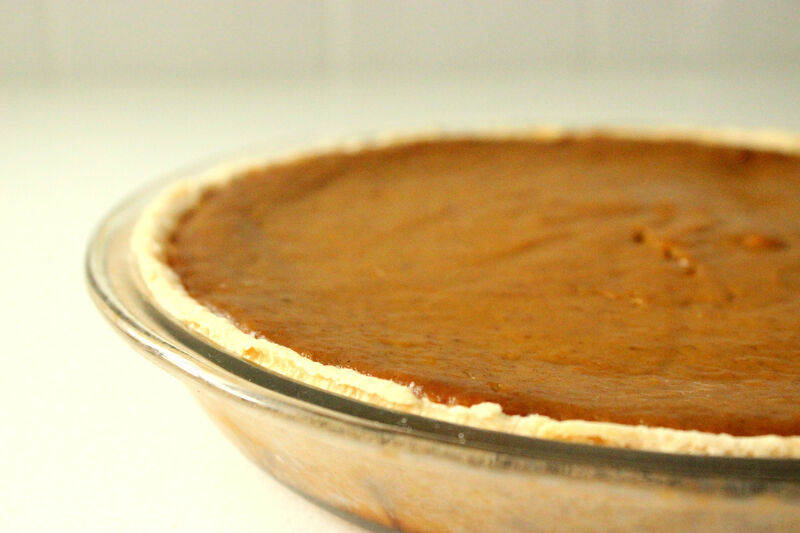 You can also opt for one deep dish crust for a thicker, richer pie. Bake in a 350F oven for about 35 to 45 minutes, until the filling is set. Let the pies cool then refrigerate for 1 hour. Serve with Honey Bourbon Whipped Cream. In a bowl, whip the cream, honey and bourbon. Serve over top of a slice of pie. 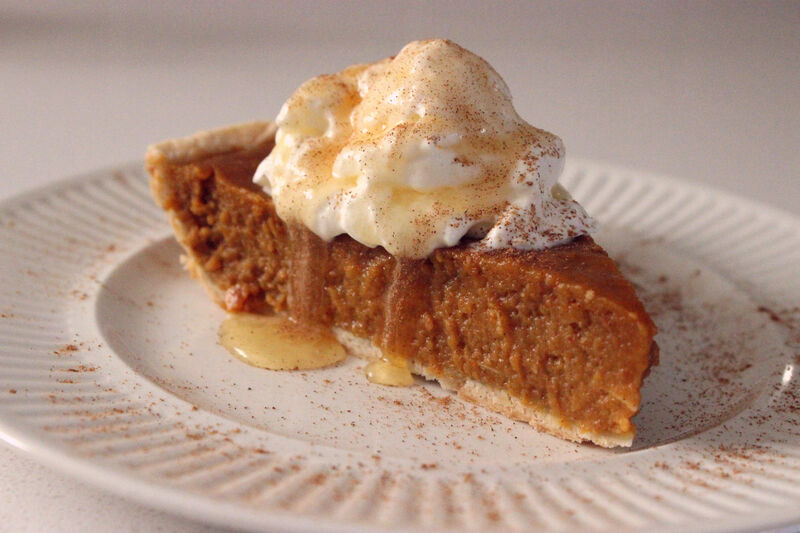 Drizzle a little honey over the top, sprinkle a little cinnamon or pumpkin spice and serve.